Caterpillar D4H LGP (Low Ground Pressure) model, Eschborn, Germany. The Caterpillar D4 track-type tractor is a small bulldozer manufactured by Caterpillar Inc.
Caterpillar first introduced the RD4 in 1936 as the diesel follow on to the successful CAT 30 gas model. The RD4 originally weighed in at 10,000 pounds, and used Caterpillar's D4400 engine, an inline four-cylinders, with a 4.25x5.50 inch bore and stroke. In 1935 Caterpillar had started the naming convention of "RD" for diesel or "R" for regular gasoline, followed by a number to indicate the relative engine size. In 1937 the "R" was dropped, and just a "D" was used for the diesel versions. At the time of introduction of the RD4, the D4400 engine produced about 43 HP at the drawbar so the 4 indicated the relative engine power. The D4 U series was fitted with the more powerful D315 engine. The later D4 series engines quickly increased in power, so the number "4" just became a figure of merit rather than indicating actual engine power. 6U = Narrow gauge 44"
7U = Wide Gauge 60"
Caterpillar D4 - 1947-59 6U1 > 6U12781, 7U1-7U44307 Cat 4-cylinder D315 engine. 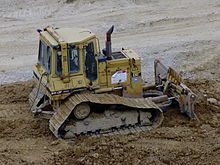 The Caterpillar D4 was used as the base tractor for the Trackson built loader that was known as the T4 or Traxcavator shovel. This page was last edited on 1 January 2019, at 07:03 (UTC).